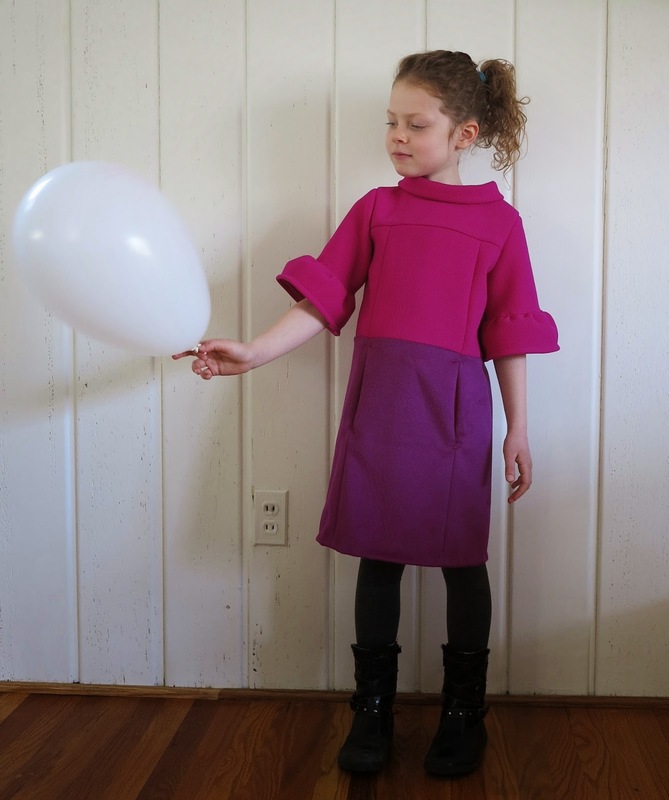 I pattern tested for Lisa Spearman of Big Little recently. You might have already seen the first sneaky peek of my test version on Instagram. It’s exciting to report that the pattern is now ready to go and it’s available in the Big Little Etsy shop until Sunday with a discount if you use the code: BOOTS. It was an utterly out of season make for me (38 degrees Celcius days are the norm for us right now) but I still jumped at the chance to be a tester for these. All I could think of was my stash of glorious little wool and cashmere scraps that are too small to do anything useful with, but far too good to throw away. 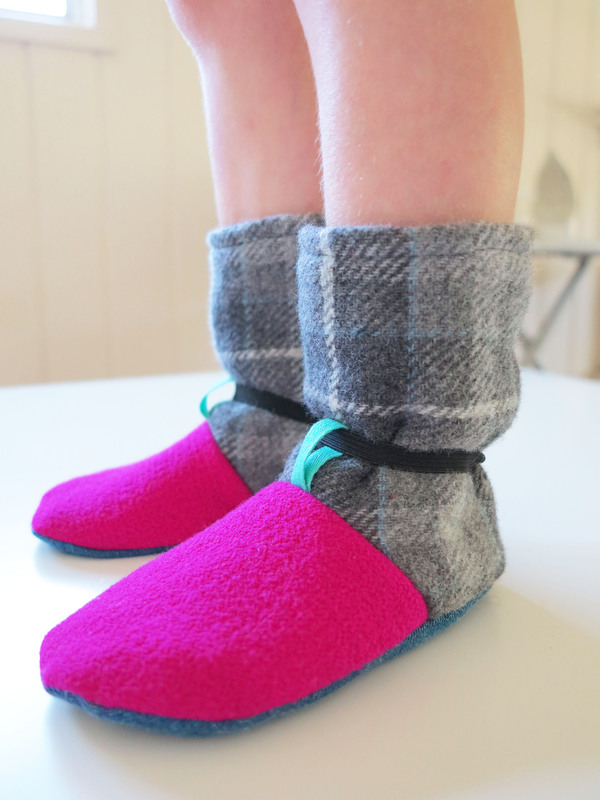 These little slippers make the perfect scrapbust for those particular fabrics. 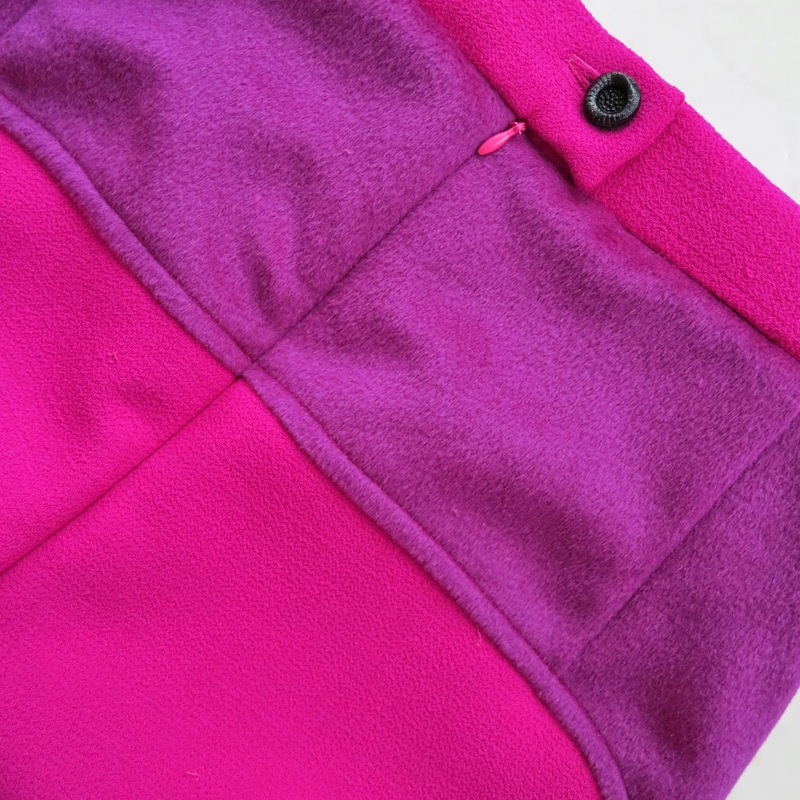 My test version was made using Italian wool coating (used here) and pink wool double crepe (seen here, and here, and here). I used denim for the soles and lined them with cashmere (remnants from my Dior coat) for the inner sole and beautiful Italian brushed cotton shirting (leftover from here). I felted all my wool and cashmere in the washing machine and dryer first. Lisa advises on how to do this but it is pretty common sense. Just think hot, hot, hot, until the fabric fibres are so tight and thick that the fabric won’t stretch anymore. I had to hide these boots from Miss Three. She was trying to wear them everywhere and I was feeling hot just looking at her. 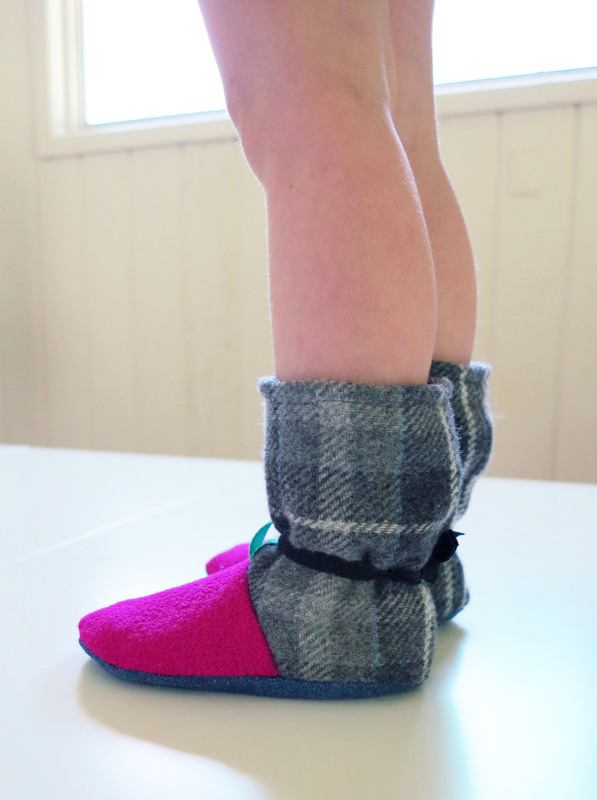 I’ll definitely be making these boots for Miss Five and Miss Seven next. In fact, I think they would make the perfect (and seasonally appropriate) Christmas stocking fillers for those of us in the Northern hemisphere. This entry was posted in Britex, cashmere, coat, cotton, crepe, denim, wool and tagged boots, Britex, cashmere, denim, Mood, scrapbusting, slippers, Tie Back Boots, wool on July 3, 2015 by Debbie Iles. 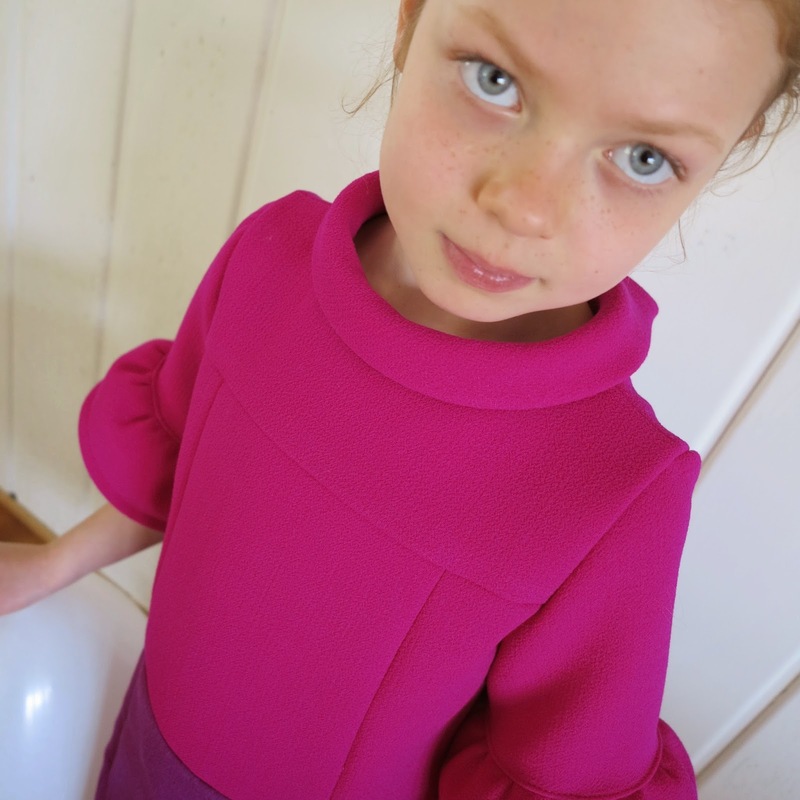 Since Christmas, Miss Six has been wearing her corduroy School Photo dress every other day. 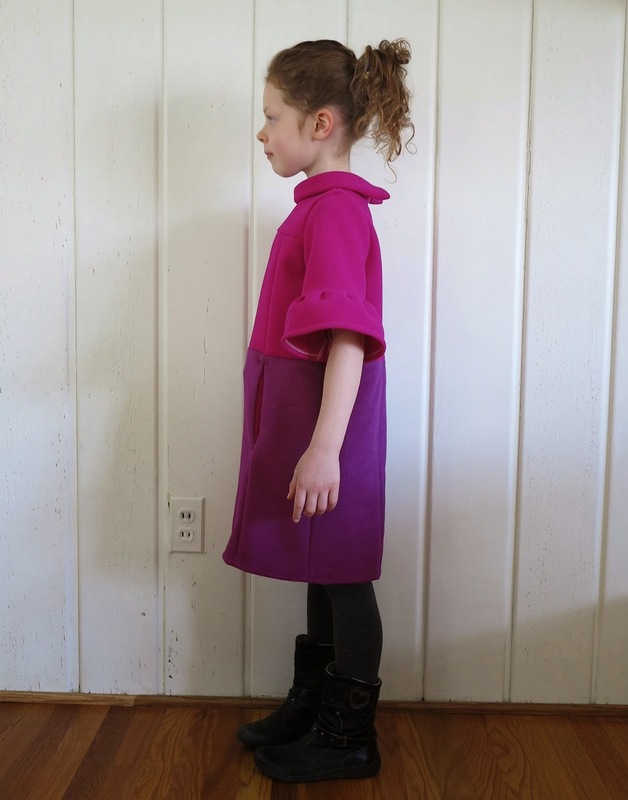 She layers it with tights and a long sleeve top to wear to school. It has become her absolute favourite dress. But even better than this is the fact that I also love the look of it. 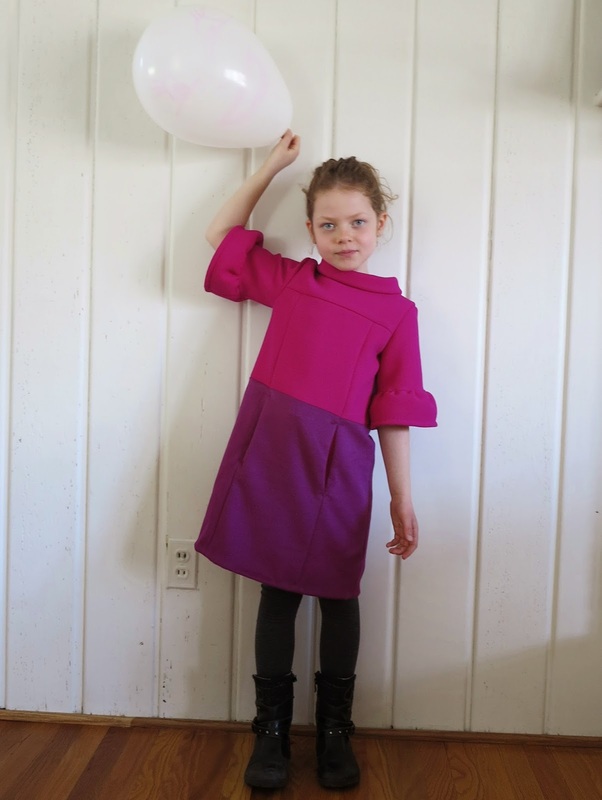 It’s a very smart looking little dress. It’s also clearly very comfortable and warm, given that it is fully lined. 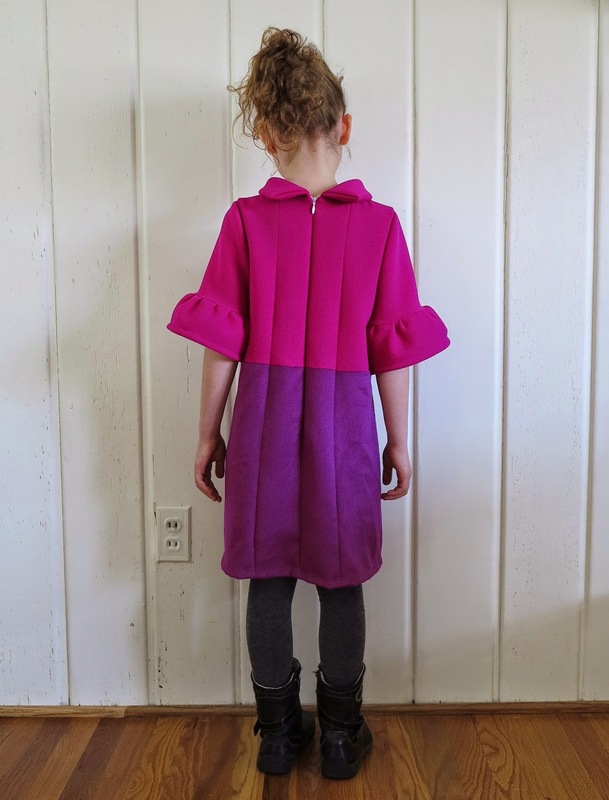 Now, I don’t often sew clothes for people outside of my immediate family, but the idea of sewing this particular dress for my niece just seemed like the most perfect idea. My niece was born only a week apart from my Miss six, so I was confident with the sizing, as well as the style. 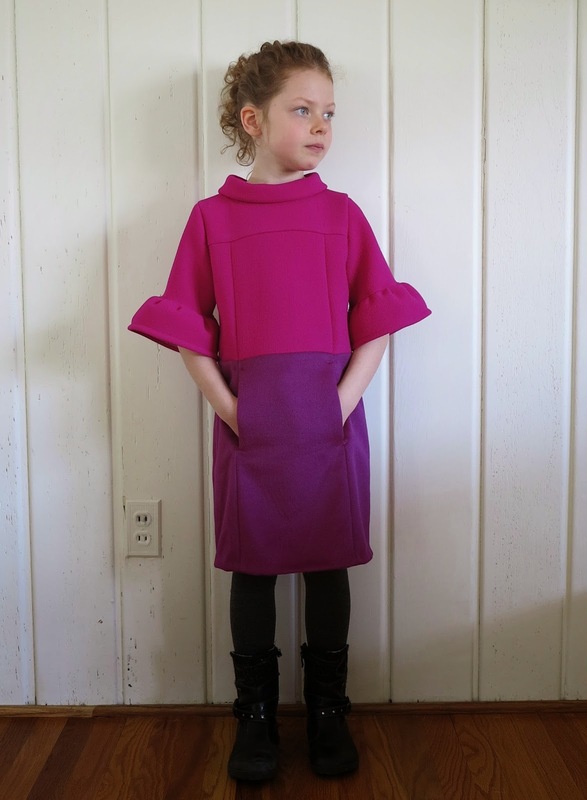 It has been such a winner of a dress with my daughter that I hope it will be loved as much by her cousin. I took my time making this dress. The hem was blind stitched by hand and the zipper was hand-stitched to the silk lining scraps, as was deserving of the beautiful fabric I was using. I’m also pretty pleased with my precision seam matching. I shared my newfound trick on how to achieve this on my Instagram account. All in all, the dress turned out beautifully. I’m super excited about sending it off to her cousin in Australia. It will arrive a few months before her birthday, but that’s how I roll with presents. My best gifts always miss the target date! And besides, I want her to be able to wear it while it will still fit perfectly, and on the odd chance that Melbourne gets a Wintery day or two before the end of Summer. 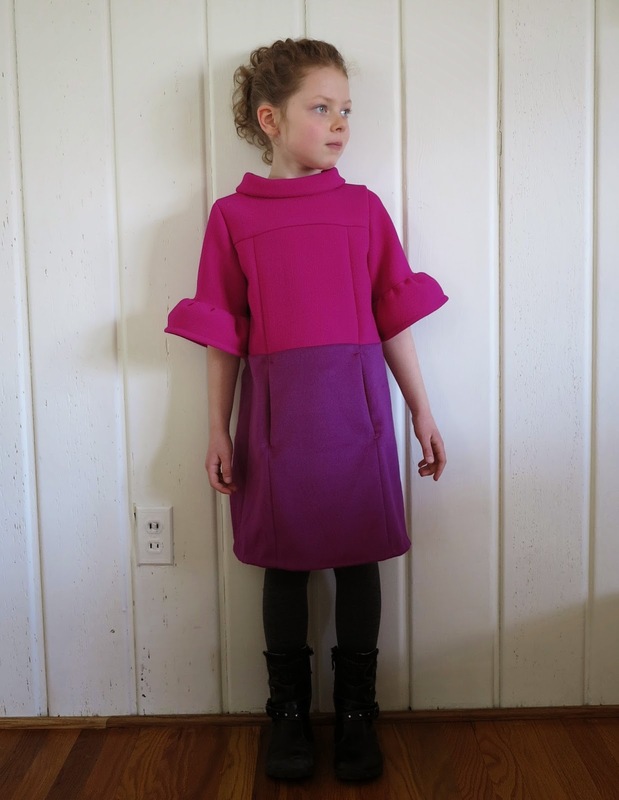 This entry was posted in cashmere, crepe, dress, Fabric & Fabric, Mood, Oliver + S, School Photo dress, silk, wool on February 4, 2015 by Debbie Iles. I know you’ve seen my fancy pants before. 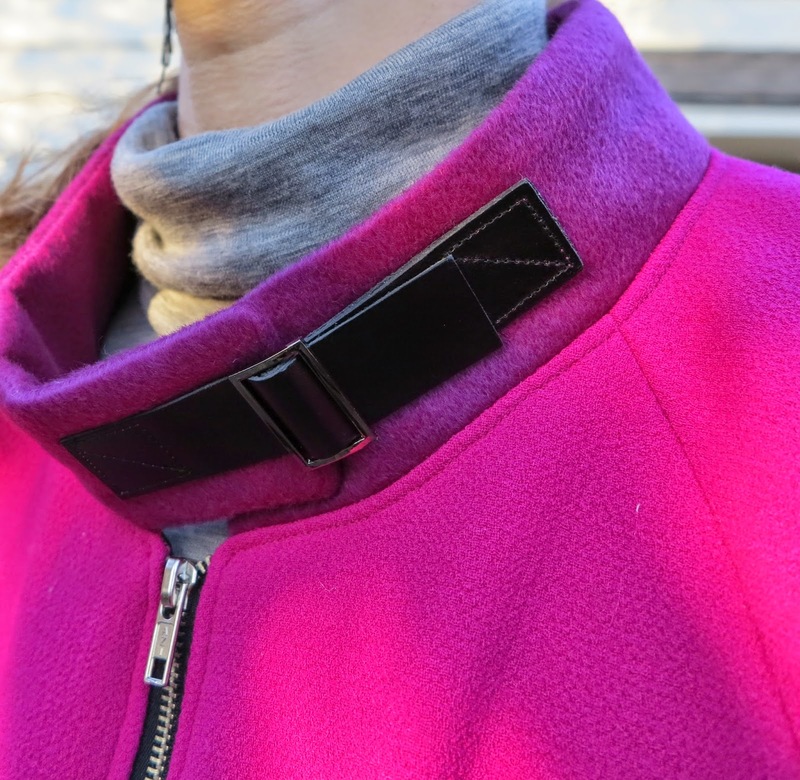 I blogged about my Rigel bomber hack recently too. And if you follow me on Instagram, I shared these pictures yesterday, so please feel free to tune out now if you already have pink-overload. Some would say that this is the mother of all two-piece set-aculars. Or, according to my husband, I’m tracksuiting it up for you. Because I can. My husband and I are celebrating our anniversary in a few weeks and I’m thinking this outfit might be perfect for that occasion. I keep warning him that one day, I am going to be that old lady with purple hair, red lipstick and rhinestones on her walking cane. My gift to you dear husband, is the perfect glimpse into your future….bwahaha! This entry was posted in cashmere, Esther shorts, Fabric & Fabric, Mood, pants, Papercut, Rigel Bomber, self-drafted, silk, twill, wool on January 16, 2015 by Debbie Iles. I had in my mind that I wanted to make a heavy, wool, maxi skirt or a pair of wide leg pants. The wide leg pants won out in the end, mainly because I feared the weight of the double faced wool crepe would just be too much in a floor length skirt. This is the problem with buying exclusively online. Sometimes I have to compromise. The fabric is gorgeous though and the weight makes for a beautifully warm and smooth structured look to the pants. The originating pattern was my Esther shorts pattern, although I actually used my Japanese corduroy culottes as a base. I narrowed the culotte legs a little from the back, lengthened them, and drafted side pockets and a contrast yoke. I used some leftover cashmere from my Dior coat as the contrast. As usual, I chose to bind the inside of the waistband. After the photos were taken, I also decided to lose the hook and bar fastener in the waistband and I made a buttonhole for a single glass button instead. 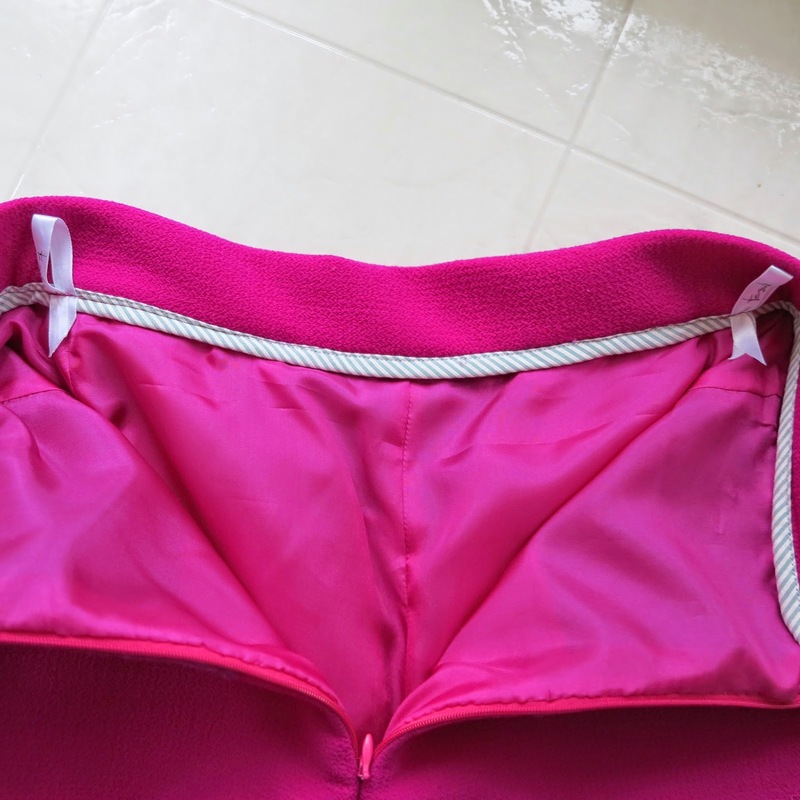 Because of the thickness of the fabric, this made for a neater and more secure finish. The Tessuti Fabric ribbons that always wrap my online fabric parcels make lovely little hanging ties for the coathangers to clip onto instead of my crushable fabric. I’m a little on the fence with this make. I love the colour and the shape of the pants, but I’m not so sure I like it together. These pants are loud! 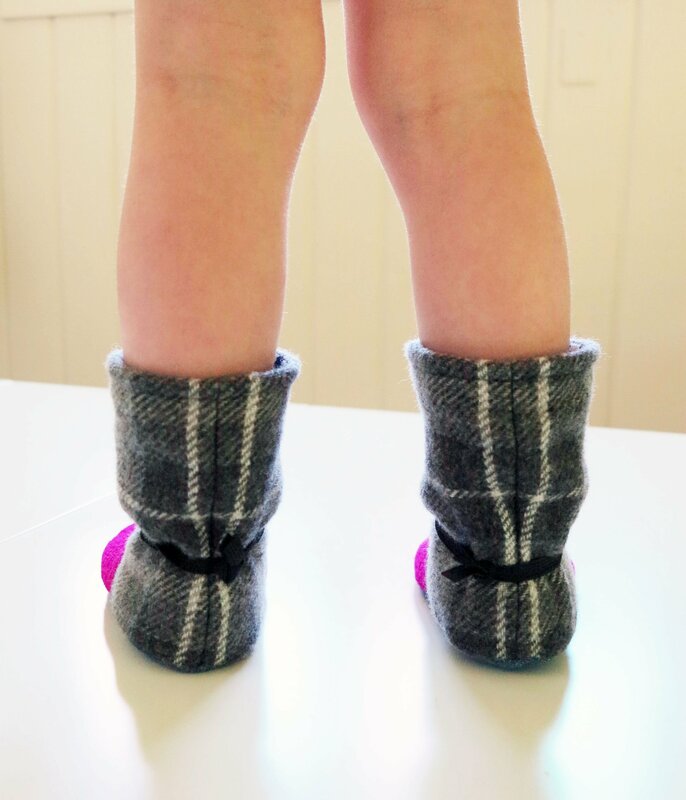 But they do fit very well and are beautifully luxurious and warm to wear. The length is also great. I’m wearing my flat gold sneakers in the photos but I actually made them long enough to accomodate a small heel. The neoprene and cord top that I’m wearing in these photos is not the top I’m intending to wear with these pants, but it does allow me to show off the yokes, pockets and full style of the pant better. I’m also not finished making the intended top, which is an epic, self-drafted, Rosie Assoulin inspired number. It’s been a lot of work, and there’s still a chance it could be a major disaster, but it will definitely deserve it’s own post when it’s finally finished. Do you have any last major projects on the go before Christmas? This entry was posted in cashmere, crepe, Esther shorts, Fabric & Fabric, Mood, Tessuti patterns, wool on December 21, 2014 by Debbie Iles.